Jumpers at J14 must be installed to enable the UART#0 over the USB bridge capability. Install jumpers at J25 to enable the ISP1301 signals for USB/OTG operation. 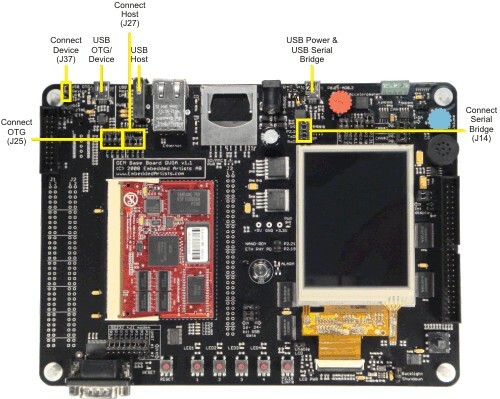 Install a jumper in the top position at J37 to allow the board to always connect as a USB device. Move the jumper to the lower position allow P0.14 to enable USB Device mode. Install jumpers at location J27 to when connecting as a USB host.